Fire ants in your garden or lawn can be a serious nuisance when it comes to enjoying your yard. Anyone who has unknowingly stepped on or around a mound knows the results can be quite painful. In late spring and early summer, you’ll often see fire ant mounds pop up almost overnight. While we have several species of fire ants native in North America, it’s usually the imported red fire ant that causes us the most grief. This species is native to Brazil but was accidentally introduced into the U.S. during the 1930s. It’s thought they hitched a ride in soil that was used as ballast in cargo ships. In Brazil, there are natural predators that keep the fire ant under control. Unfortunately, here in the U.S. fire ant populations have exploded without the presence of natural predators. We now have almost ten times the population of fire ants here in the U.S. as compared to Brazil. If you’re committed to organic gardening and landscape maintenance, then you can’t simply whip out the standard chemicals used to treat these pests. It takes a smarter and more patient approach. There are several very effective organic treatments for fire ants. Naturally derived botanical oils, such as Wintergreen, are used effectively as mound drenches. Spinosad, the active ingredient in many organic treatments, is produced by a soil-borne microbe. The metabolites the microbes produce are harvested and used as a bio-pesticide. Organic fire ant control products containing Spinosad are found in liquid products and dry baits. 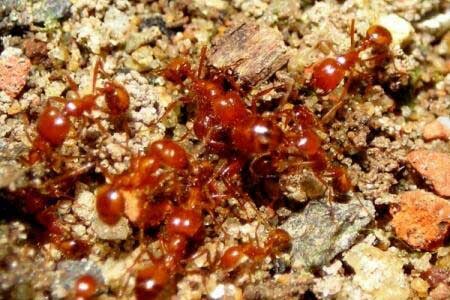 Here at Soils Alive, we provide organic fire ant control as a special service, or we can add it to your Soil Building program. If you have a fire ant problem in your landscape and care about using organic control, please give us a call at 972.272.9211 or contact us online.